PNML Framework is a prototype implementation of ISO/IEC-15909 part 2, International Standard on Petri Net Markup Language. The primary purpose of PNML is to enable interoperability among Petri net tools. 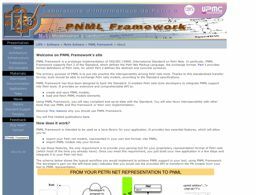 PNML framework has thus been designed to back the Standard. It will enable Petri nets tools developers to seamlessly integrate PNML support into their tools. It provides an extensive and comprehensible API to create, save, load and browse PNML models.